What I believe is that good things come to those who work their asses off. 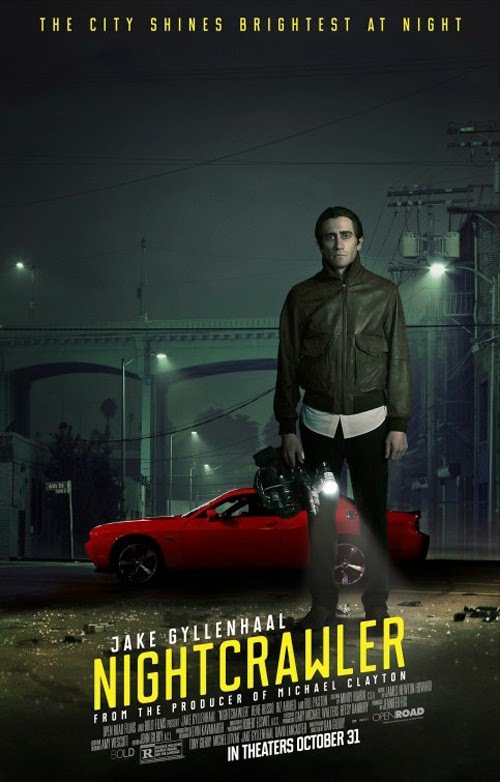 (SPOILERS) A meticulously constructed thriller, at first glance Nightcrawler appears to position itself as a media satire in the vein of Network; only with a 21st century makeover. Yet, as biting as the chunks it takes out of the TV business are, it becomes ever more clear as the film progresses that the target is really the unfeeling soulless executive and the corporate mentality that will screw anyone over without a second thought in the name of profit and getting ahead. At the centre of the Dan Gilroy’s movie, one of the best and most unsettling of the year, is a startling, mesmerising performance from Jake Gyllenhaal; when it comes to big screen sociopaths, his Louis Bloom can comfortable take an instant place in the upper pantheon. Nightcrawler is the directorial debut of Tony Gilroy’s little brother, who thus far has resided somewhat in his brother’s shadow. Not only does the brutal, jugular-orientated script change all that (Gilroy’s efforts are wholly restrained and mild-mannered in comparison) but as a director Dan pulls of some remarkably virtuoso feats not least an extended stakeout-come car chase that ranks as one of the most heart-in-mouth action sequences put on celluloid (well, digital) in recent memory (and that follows another heart-in-mouth scene of a different nature, as Lou takes advantage of an early arrival at the scene of a home invasion). Hitherto, Dan Gilroy’s name has been attached to a series of inauspicious vehicles, from classic (I kid) Estevez-Jagger starrer Freejack, to Pacino’s late mentor period teaming with McConaughy (Two for the Money; terrible title, pedestrian film), Hugh Jackman, mewling kid and robot boxer pic Real Steel, the visually splendid but otherwise less assured The Fall and co-credit on Tony’s The Bourne Legacy (which, despite the infamous Stims has much going for it). Nothing in that lot suggests the greatness of Nightcrawler, although his brother has been involved in a series of topical and politically astute pictures from the Bourne series to Michael Clayton, and the movie version of State of Play (he has also signed up as consultant on Season Three of House of Cards). The only problem with striking so hot, straight off the director’s bat, is that the sophomore effort has a lot to live up to (Tony’s, the playful but slight Duplicity, unfortunately didn’t). Lou Bloom’s entry into the world of the stringer (a term for freelance journalist) is sudden and his rise swift. A petty thief, he begins shooting footage of crash and crime scenes after seeing how easy it seems to be for soon-to-be-rival Joe’s (Bill Paxton) film crew. And he proves to be a natural, not just at shooting – he gets stuck into the action and all the gory details, frequently to the indignation of the rescue services and victims – but at selling his wares to a local TV station where news director Nina (Rene Russo) is more than willing to buy his headline-making material. As he makes a name for himself, so Lou’s horizons broaden. He takes on an intern (the flustered, skittish Rick; Riz Ahmed of Four Lions and Centurion), whom he baffles with motivational speak and arguments for how an intern should work for nothing (Rick settles for next-to; $30 a night). When he eventually promotes Rick, to vice president (glorified assistant), his wage rises to a rarefied $75. There’s nothing thinly disguised about Gilroy’s commentary on the kind of shameless exploitation freely indulged by today’s corporations and encouraged by governments as a matter-of-course – it has become an accepted norm not to pay a decent wage, or even a wage at all, as if the hallowed experience is something the lack-of-wage slave should be grateful for; they should be paying the company really, and effectively are – but the sub-Patrick Bateman executive blarney is delivered with such oiled conviction by Gyllenhaal it takes on twisted, mirthful proportions. Lou transacts the starkest and darkest of deals with Nina, bribing bedroom favours from her and on-air promotion (his is a “professional news gathering service” announce the anchors when showing his sold footage) in exchange for the scoops he can offer. And his astute but entirely empathy-free insights into those he deals with find him carefully and confidently dissecting the insecurities of Nina’s life as a mature woman without job security and contending with the pressures of medical insurance; as he later says to the unfortunate Rick, “What if my problem wasn’t that I don’t understand people but that I don’t like them?” Although that may even be overstating the case. Lou is indifferent to others except as commodities or stepping-stones to secure where his destination. Russo, whose most notable role recently has been as Thor’s mum (the unfortunately named Frigga) is outstanding as the does-whatever-it-takes exec who knows time is not on her side. In some respects her character is even more alarming than Gyllenhaal’s. She recognises the lines that should not be crossed, but doesn’t think twice about traversing them in her quest to secure ratings (after all, she frames their ideal news spot – a spiel she has no doubt used with every stringer that has crossed the station threshold – as a screaming woman running down the street with her throat cut). Nina can tell right from wrong, unlike the eccentrically indifferent Lou, but she chooses to justify her decisions by shrouding herself in the requirements of the job. When shown particularly horrific footage of the home invasion victims, she asks a colleague where they stand on screening it. And just so her colleague understands, she qualifies her question; “legally, not morally”. So, despite of the manner in which Lou takes advantage, there’s little doubt that these two deserve each other, and concordantly theirs is a productive liaison. Part of the abject beauty of Nightcrawler is the manner in which Lou’s malaise of the mind is the perfect impediment to enable his progress. Gilroy’s boardroom analogy is as delicious as it is chilling, as Lou literally thrives on misery and anguish. Bloody mayhem becomes all about the framing so as to best capture the moment, but he’s no more the budding artiste than someone who wants to get his foot in the door at the TV station (he laughs off Nina’s production assistant offer). Lou’s goal is to be the boss of his own thriving business, which by the end of the movie he is. We see him issuing the same empty motivational platitudes that he gushed to Rick, with the final delicious urging that he wouldn’t ask his staff to do anything he wouldn’t do himself; which, of course, includes capital crimes. Gilroy has posited that in 10 years time Lou would be running a major multinational corporation, and the writer-director’s thesis is much the same as the one – which garnered much attention – positing that it is the psychopathy of bankers that has brought the world to its knees financially; their ruthlessness knows no bounds. Straying ever further from lines of professional behaviour (such as they are, for such a code-of-conduct-challenged activity) marks Lou's ascension as a stringer, never mind the ethics involved. We already know he has the capacity for guile and untold violence from the first scene, where he beats up a security guard for his watch. Lou is clumsy at first, muddling through crime and accident scenes and coming up short on more than one occasion. Arriving late for an incident, he steals in through the back door of the victim’s house and videos the family photos he has rearranged on the fridge (next to complementary bullet holes) in order to create the perfect visual narrative. But the real turning point comes when Lou arrives at a car accident to find the emergency services have not yet arrived. Free to get the best shots and angles he wants, he realises the victim’s body is not in the most advantageous spot aesthetically… so he corpse a few hundred yards into the light. One wouldn’t say Lou spirals out of control, though; quite the reverse, he pushes situations because he is in control and we play catch up with his capacity for immoral behaviour. When rival stringer Joe (Bill Paxton) bests him on one too many calls, Lou cuts his brake cables and puts him in a wreck (and then moves in for Joe’s gurneyed close-up at the scene of the van wreck). The last part of Nightcrawler is essentially one long freefall that follows the aforementioned home invasion. Again, Lou arrives at the scene first. However, on this occasion he’s so early the perpetrators are still there. The genius of Gilroy’s construction comes from the nerve-racking tension he creates as Lou moves around the house getting the shots and coverage he needs, utterly unmoved by the bloodied bodies he finds. We shouldn’t, because his behaviour is abhorrent, but we care lest he be discovered. Lou compounds his opportunism by withholding footage that identifies the criminals. Then, topping all prior deranged deviousness, he tails the perpetrators until he can arrange the ultimate cops-and-robbers shoot out. During which he takes the opportunity to dispose of his now undependable assistant and proceeds to record his death throes (like Joe, Rick has crossed the line by threatening Lou’s career path). Gilroy is pushing the (lack of) principles of Kirk Douglas’ newsmaker in Ace in the Hole to their logical extreme. Gilroy’s filmmaking, aided by his brother’s regular DP Robert Elswit (shooting deep focus and wide angle, the night photography in particular is outstanding – vivid, rich, clear and precise – and the action is edited for maximum coherence; a breath of fresh air in an any-old-shakycam-will-do era) comes into its own during this extended passage. He infuses the picture with an edge-of-seat unpredictability. That the protagonist is thriving on this very uncertainty, for the benefit of his footage and career path, only adds to the seamlessness of Gilroy’s design. Gyllenhaal’s performance is phenomenal. I’ll readily admit to not having been all that impressed by him subsequent to Donnie Darko putting him on the map, but the effect here is utterly transformative. A gaunt, wiry freak with greased-down hair, a clipped, high-pitched voice and a weird walk (his hands don’t quite keep up with him), Gyllenhaal apparently modelled himself on a coyote. I was put more in mind of something coldblooded and reptilian about this intense, probing, bug-eyed ghoul. He knows no boundaries, has no pulse, and has insincere smile has been scored across his face through practicing human behaviour in the mirror. Lou display’s the obsessive’s traits of carefully saving his screened recordings and methodically feeding his planets. He also hoovers up career guidance seminars, which he quotes verbatim to support his business model. Yet he is far from your classic introvert; he lacks such self-awareness and emotional barriers. Lou’s single-minded embrace of business targets is terrifying. There’s something of Hannibal Lecter about the character, in that he is a larger-than-life villain who becomes hypnotic to watch due to the sheer verve of the lead actor’s performance. Realism isn’t the key to Lou’s success as a character, so the lack thereof doesn’t diminish the effectiveness of the performance; Gyllenhaal rides the line perfectly of making Lou unendingly creepy and disturbing while also delivering a great comic turn. Just witness his reaction to The Court Jester on TV (if he likes that film, Lou cant be all bad). James Newton Howard’s score seems to get the joke, ironically commenting on Lou’s rise to fame with the ambient euphoria of a Michael Mann soundtrack. There’s the odd weakness en route. Gilroy’s a bit over fond of his sound bite message about white fears of urban crime, and Gyllenhaal nearly doesn’t get away with Lou’s statistical breakdown of the same (how fear of crime is on the increase even though figures are down; the effect coming courtesy of the partial TV outlets). It’s an overtly moralising position that has to be fed through Lou’s “merely making a note” filter. Criticisms of whether the extremes of Lou’s footage could make it on TV are really beside the point, since the absence of moral compass is the picture’s focus. If I were to pick up one slight disappointment, it’s that the very thing Gilroy has discussed in interviews could have been realised further; Lou’s climb up the corporate ladder, A How to Succeed at Business without Really Trying with blood and claws would have been enticing, although it might have been too on the nose. Of course, Lou is really trying; his repeated mantras extol job interview-speak pronouncements of how he is a hard worker. It doesn’t matter what you do, as long as you work hard at it, as career success is the sum meaning of life. A consequence is that, for all its audacity, Gilroy has opted for a narrative safety zone rather than pushing the satirical element as far as it could possibly go. 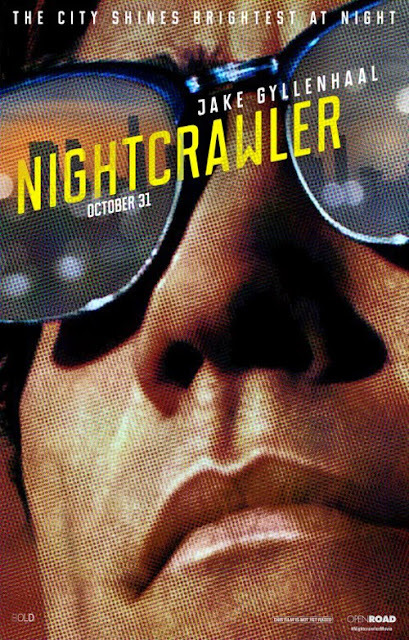 So there is a nagging feeling that Nightcrawler is a better thriller than it is a satire, but Dan Gilroy has made a nigh-on perfectly formed debut feature; riveting, alarming, shocking, hilarious. Many have compared the film to Taxi Driver, but that seems to me to be barking up the wrong tree entirely. Far more appropriate are those naming another Scorsese picture, The King of Comedy. Nightcrawler doesn’t have, nor does it aim for, the realism of the tale of Travis Bickle, but Lou does share traits with the large than life, grotesque, deluded and delusional Rupert Pupkin. Both are sociopaths obsessed with getting ahead and making it, their ability to interact with the world enabled through a false confidence that compensates for their incompleteness and social maladjustment. But Gilroy also needs to have us embrace Lou Bloom narratively while making us queasy for doing so; Lou succeeds at everything he does, and we’re put right in the driving seat and viewfinder with him. He’s a living embodiment of the American Dream; he has to succeed, as opposed to the tentative destination for Pupkin, because his kind are the ones who always succeed. Even if it brings the rest of us to ruin.